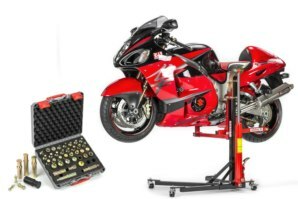 This package combines the Sky Lift, Technicians kit and a common range of spool and Hub adapters so the Sky Lift can be used in a workshop on over 350+ different motorcycles. 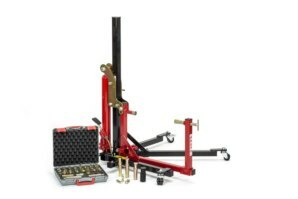 The Sky Lift is a motorcycle work bench and stand all in one... You will not be restricted when working under a motorcycle as you would with a workbench, both wheels can (individually) be raised higher off the ground than most standard bench's and above all else you can push the bike around freely whilst elevated anywhere in your workshop. When not in use the lift takes up a fraction of the space of a conventional bench. No other stand, lift, jack or bench will enable more work to be carried out on a motorcycle than the abba Sky Lift. You can remove the fairings, wheels, forks, shock, engine and even the swing arm with our Swing arm Removal kit. In fact, every last nut bolt and washer can be dismantled down to leaving the bare frame attached to the lift. NEW - Upgraded for 2017. 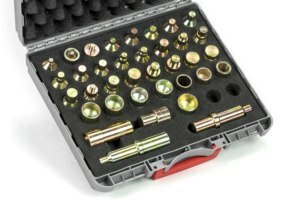 The Technicians kit now has 36 separate fittings to adapt the Sky Lift to fit over 350+ models of motorcycle. Fits motorbikes from the early 1980's through to brand new current models! NEW - Now supplied with our 3rd generation hydraulic ram. The new internals of our latest ram, combined with the foot pedal operation mean the lifting speed is around 40% faster than shown in some of our original videos. It now only takes around 35 seconds to lift to max height! abba Sky Lift - Full product details here. abba Technicians Kit - Full product details here. abba spool & Hub adapters - Full product details here. 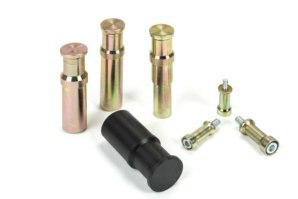 6mm, 8mm, 10mm spool adapters supplied as well as four hub spindles suitable for most common Triumph, Honda and Ducati single sided swing arm motorcycles. NOTE: The Technicians Kit does NOT include the Swing Arm Removal Kit as standard. Sky Lift Gallery - See many photos of different motorcycles on the Sky Lift, photos provided from previous customers. Fitting Application - If you need more detailed information on where the Sky Lift fits your bike, or how our fitting kits work you should find it here. Product instructions - Can be found on this page. No modifications or parts to be permanently fitted, just select the correct fittings from the technicians kit and your ready to lift the particular bike. One person, quick and simple operation. The bike stays very safe and secure, the Sky Lift locks to both sides of the swing-arm pivot for maximum security. The wheels, forks, triple clamps, shock & engine can all be removed, in fact everything down to the bare frame! Even the swing-arm can be removed with our Swing Arm Removal Kit. Off loads suspension front and rear unlike conventional paddock and race stands. The bike can be locked off at 4 different locking positions for additional safety. (No load on hydraulic pump). Takes up considerably less space and allows far more access than a workbench/table. Allows you to reach virtually every component on a motorcycle at a comfortable working height. Fully maneuverable, push your bike into the corner of the garage and wheel back out when work needs to be done! 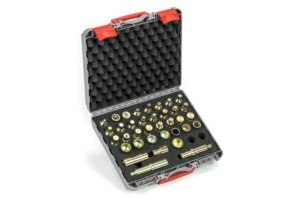 The Technicians kit now has 36 separate fittings to adapt the Sky Lift to fit over 350+ models of motorcycle. Fits motorbikes from the early 1980's through to brand new current models! New Product demonstration video of the abba Sky Lift, lifting a Suzuki Hayabusa. Sky Lift instructional video showing all key features and how to fully operate the lift. Lifting a Yamaha FZ1. Assembly video showing how to fully assemble the abba Sky Lift. What kind of bikes does this package cover? The Technicians kit covers a vast range of motorcycles including Sports, Sports Tourers and Superbikes from the ealry 1980's through to current day motorcycles. Twin sided and single sided swing-arm models. It will also fit many other motorcycles not listed in the comprehensive fitment guide just by matching up a correct fitting sizes to the swing arm pivot hole or bolt/nut head. Is it easy to convert the lift from one bike to the next? Your lift fits on the swing-arm pivot, how can I remove my swing-arm? We sell an optional swing-arm removal kit which fits onto the footrest hanger mounts. This then allows you to fit the lift with access to the swing-arm pivot, in this mode you can strip the bike down to the bare frame. Lifting the bike in the "stoppie" position will enable you to raise the swing arm up to perfect working height. Absolutely not! With the abba Sky Lift your bike will stay totally standard, no modifications or parts to be fitted. spool adapters or hub spindles can be fitted if required and removed in seconds when finished. What is the maximum weight the Sky Lift can take? If we manufacture a fitting kit for the bike it will safely lift the bikes weight. The Sky Lift incorporates a 3-Ton hydraulic pump. The lift itself can safely lift a 400kg motorcycle. Do I have to locate the strap around a spool adapter? Not necessarily. On all conventional twin sided Swing-Arm motorcycles the lifting strap can be used around the Swing-Arm itself. This is a slightly slower operation as the strap has to be looped around the Swing-Arm and back through the buckle each time. Or the strap could be located on an existing paddock stand spool. Single sided Swing-Arm motorcycles will require a Hub spindle to locate the lifting strap around. If I use a hub spindle on my single sided swing-arm bike, can I still remove the rear wheel? The hub spindle fits inside the rear wheel hub and therefore does not effect the removal of the rear wheel. Both wheels can be removed from the bike when using the Sky Lift in conjunction with a Hub Spindle. If you wish to remove the bikes hub just lift the bike in the "stoppie" position (this does not require the strap to be connected) and the whole hub assembly can be removed. Is it safe to leave my bike on the abba Sky Lift - i.e winter storage? Of course! Thats what the lift is designed for, you can leave your bike on the Sky Lift indefinitely. In fact if you do not use your bike for one day or one year the Lift will keep your bike safe, upright, prevent unnecessary flat spots on tyres and compression on shock/fork springs. How long does assembly and fitting take? When you first receive your Sky Lift some very basic assembly is required. This can be seen by watching our "Sky Lift Video 3". Assembly takes around 15 minutes to complete. Once assembled the Sky Lift can be fitted with both wheels raised off the ground in a matter of seconds, to raise the bike to its very highest point will take an extra minute or so. How long does it take to raise the bike to maximum height? All new Sky Lifts sold come with our 3rd generation hydraulic pump which is foot operated. You can raise the bike so both wheels are off the ground in just a few seconds. To raise your bike from its resting point to maximum height only takes around 35 seconds. Lowering the bike to the ground takes a mear 5 seconds. Does the abba Sky Lift come with a guarantee? Absolutely! As with all abba products, and to give you complete peace of mind, we offer a full 3 year guarantee. As we do not manufacture the hydraulic pump in house the guarantee on this component is the manufactures standard 1 year guarantee. I am worried about the reliability of the Hydraulic pump? We understand that purchasing anything hydraulic or electrical can have more reliability issues than something without. As the Hydraulic unit on our Sky Lift is capable of lifting 3 Ton, and bearing in mind most bikes we are lifting are under 300KG the unit is only being used at 10% of its capability. During extensive testing we have found the pumps to be extremely reliable. Remember, we only use the hydraulic unit for lifting and lowering. The bikes weight is not supported on the hydraulic unit for any length of time. Should something go wrong with the hydraulic pump, what can be done? In the unlikely event you do have problems with your hydraulic pump, most parts including seal kits are available at low cost direct from us. We also sell the hydraulic unit at a "cost price" should the worst happen years down the line ensuring your lift will always be fully safe and functional. Got a Question about the abba Pro Sky Lift Package? If you would like to ask us a question about the abba Pro Sky Lift Package, simply fill in the form below and we will contact you within two working days. Want to tell a friend about the abba Pro Sky Lift Package? Alternatively fill in the form below and we will send an email on your behalf to your friend, with a link to this page all about the abba Pro Sky Lift Package.